So, did you see the above picture carefully? I’m sure most of you smiled. 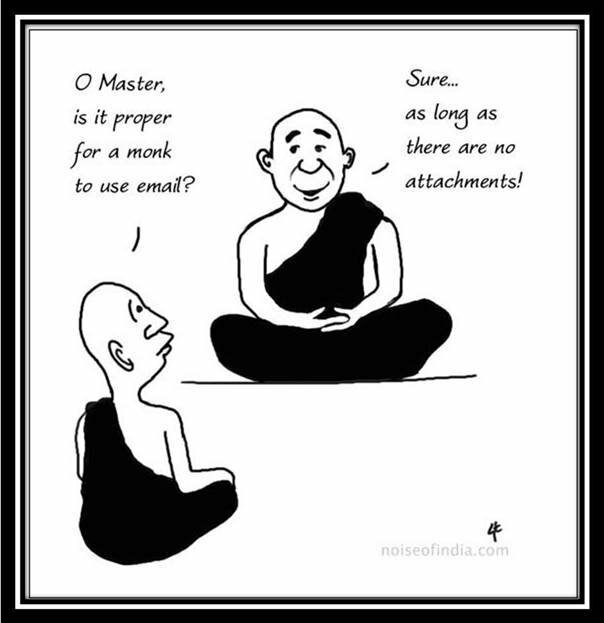 But I guess without even the monk telling us, we are all following his message very skillfully. I know it is THE 21st century. We all have our own professional horizons to be achieved. We all want to be rich, relaxed and live a king size life. We all have a dream of buying an Audi and a sea faced house. But what is all this making us into? ROBOTS may be. while they were looking for probable brides. In the process of gender equality, while competing with each other at all fronts, both young mothers and fathers, seem to have forgotten about what efforts both their parents took to raise them together, and how much time did they invest in them while rearing the little ones. But currently, even the parent-child bond just tends to be limited to meeting after office hours, may be during one of the meals, or while going for movies and malls. Children seem to be more attached to the teachers, baby sitters and counselors in schools than to their parents. Having grandparents at home is like the rarest thing. I would say it’s a luxury that’s hard to get. How materialistic have we become? Why do we compete so much? For what? For just a good lifestyle? Which means having a big house, a big car, and a healthy bank balance? Aan haan…then we surely have become robots…It may be the need of an hour for this century…but then who decides the need? just want us all to be careful about- at the cost of WHAT????? me we would be far happier and motivated than what we are today. Well if you find no such place on earth, SNEH could be your one stop shop for sure! Looking forward for new connections and even old ones along with attachment but of course! I agree with most of the points. Yes people are not able to draw a line between desires and price paid for this. Success comes with a price, are you ready to pay but you will have to decide what is the line. Balance between desires and happiness, love, affection is very imp. Beautifully written. Yes, I do agree that we don’t have attachments anywhere. We are planning for those things which are not even sure to come to us on the cost of loosing that what we have! I would rather say that the planning for a better lifestyle for family is ‘an Egoist’ formation as we don’t have loving families (including friends, families, cousins and all near and dear one’s) close by at all. The good Balance would be a key to overcome this. A very well written piece trying to portray today’s generation of being trendy and cool. Still hardly able to understand why people are so busy trying to impress things which hardly mattered then. It’s surely about the status in the society or maybe the society’s interpretation have changed to make people adapt themselves to the newer thoughts. I can hardly think of my childhood days which were anti social or not spending most of the time interacting with the people around. Main problem arising is improper use of the technology which is making our parts and satisfying ourselves with the limited virtual world. For me the only solution would be the strong grooming right from the childhood which would be highly fundamental.